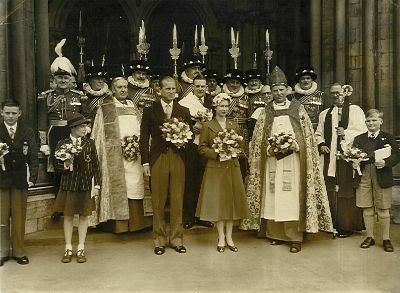 We would welcome more photographs for this section. 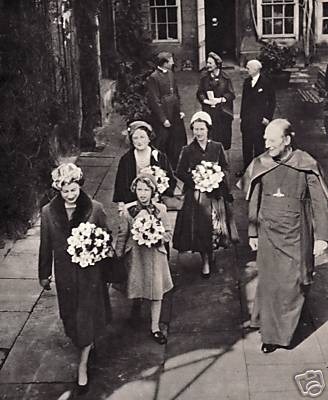 A curious feature of the ceremony is that there are always present four children, who, like the clergy, wear white scarves and carry white flowers. 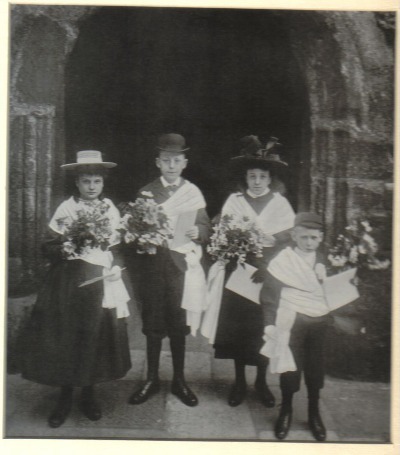 These represent the Children of the Royal Almonry, four old men, who prior to 1808 had the right of providing the towels, and of afterwards selling them, and who were paid £21 for participating in the ceremony. 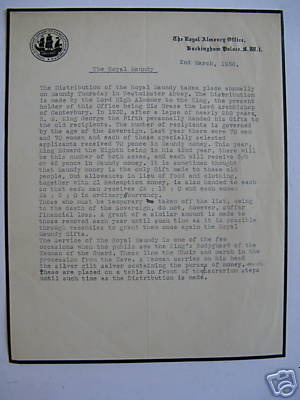 When the charity was recognised their office was abolished, and real children were substituted. 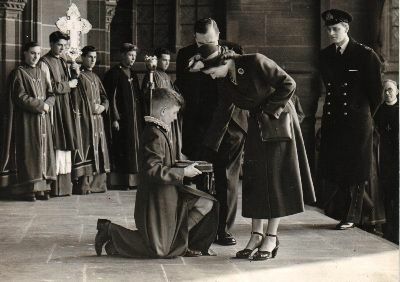 The chidren received five guineas annually, from the age of seven to fourteen years, for their education, and were also given a fee of 5s each for their attendance at the distribution of maundy money. 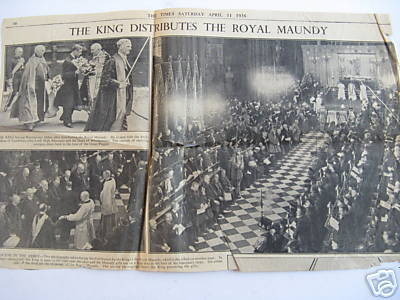 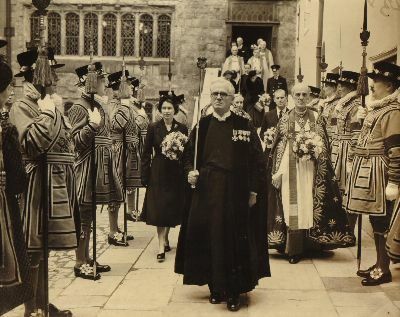 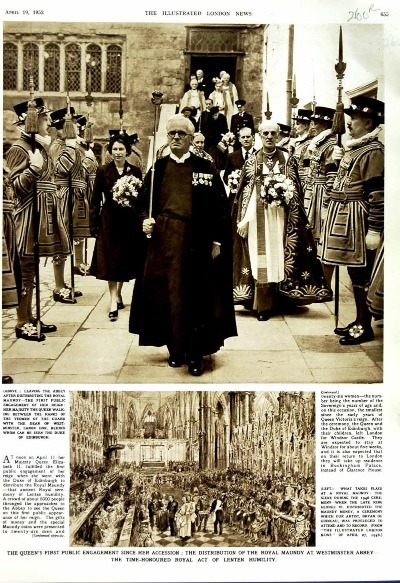 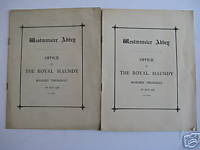 King Edward took part in the ceremony of distributing maundy money at Westminster Abbey. 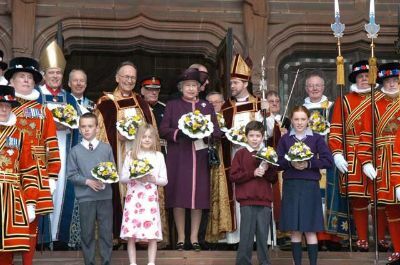 This was the second time in 200 years that a King had himself attended the ceremony. 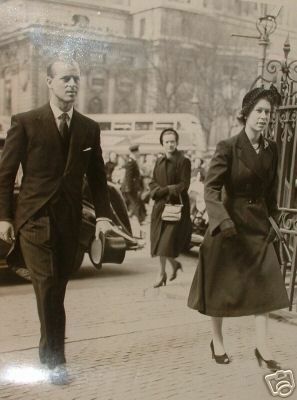 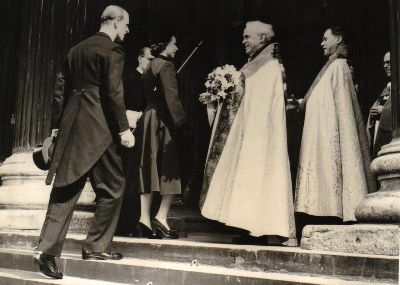 The Queen being received by the Dean of St Pauls cathedral.In the rear is the Duke of Edinburgh. 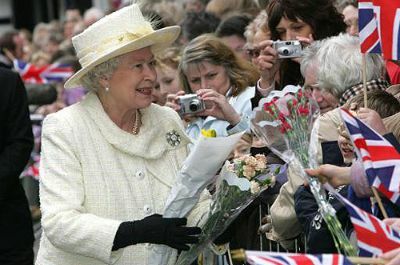 This was the Queens first public engagement since the death of Queen Mary. 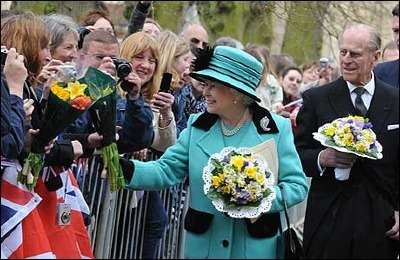 Following the ceremony the Royal couple left London to return to Windsor. 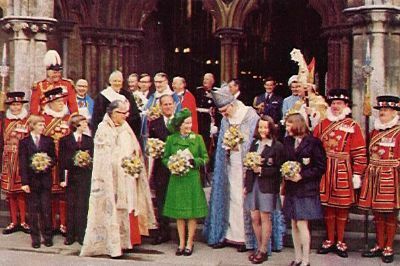 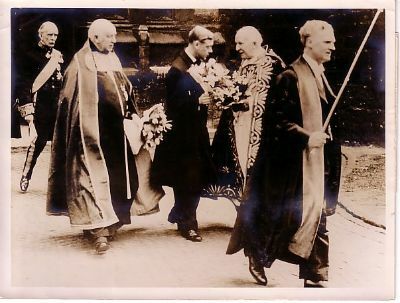 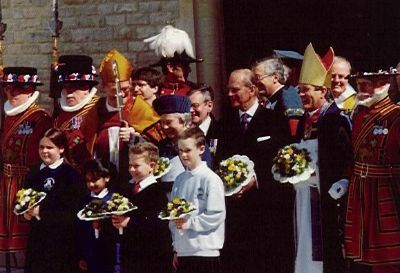 The Queen and the Duke carrying the traditional posies of sweet herbs (an ancient precaution against infection), pictured with the clergy and children representing recipients of the Royal Maundy after the Maundy thursday service at St Albans Abbey, Hertfordshire. 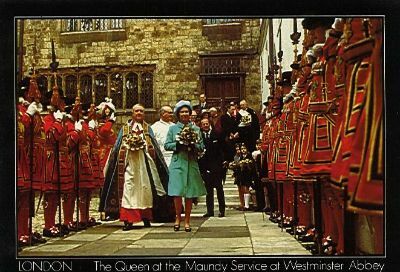 In the background are members of the Queens bodyguard of the Yeomen of the Guard. 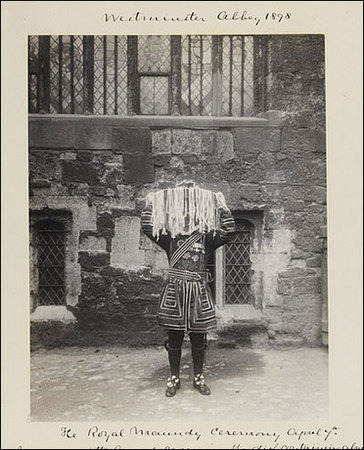 This was the first time since the days of Charles II that the sovereign had distributed money outside of London. 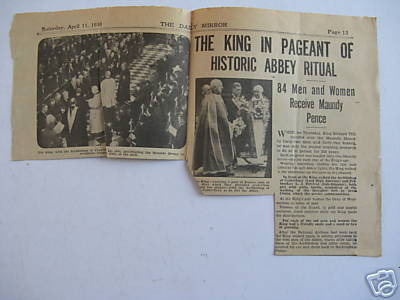 It was also the first time the money had been given at the 11th Century Abbey. 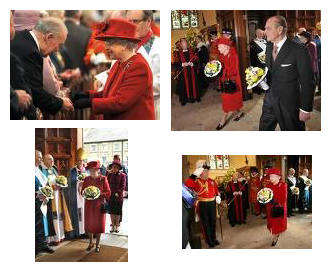 Thirty One men and 31 women, as many as the sovereign has years, received the specially minted silver coins. 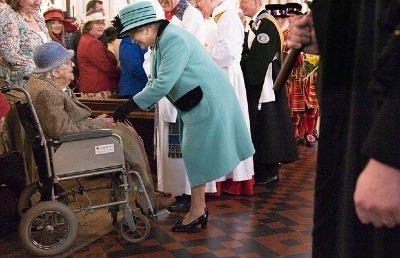 In addition they received payment in lieu of food and clothing previously distributed. 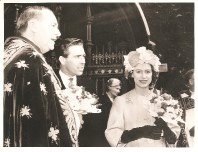 1962 Princess Margaret at the maundy ceremony.